This article is about the U.S. uniform. For the similarly named British combat uniform worn from 1939 to 1961, see Battle Dress. The Battle Dress Uniform (BDU) is a camouflaged combat uniform that was used by the United States Armed Forces as their standard combat uniform from the early 1980s to the mid-2000s. Since then, it has been replaced or supplanted in every branch of the U.S. Armed Forces. U.S. Marine Corps BDU blouse in woodland pattern, wearer's nametape removed. The ironed-on "EGA" on the breast pocket is barely visible due to wear. As late as 2014, BDUs were worn by officers of the U.S. Public Health Service as the prescribed uniform for deployment, but have since been replaced by a variant of the U.S. Coast Guard's Operational Dress Uniform. 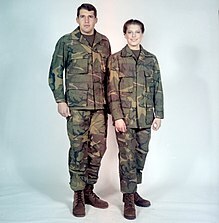 A man and woman modelling early prototypes of the BDU in 1980. U.S. Air Force Security Forces Defenders train at Fort Huachuca, Arizona in October 2004, wearing BDUs. A U.S. Air Force missile maintainer, wearing a BDU, inspects an ICBM guidance system in March 2006. While the Italian Army was the first military organization to issue camouflaged clothing, albeit in limited numbers, the Germans were noted for their efforts in this field before the Second World War. After much trial, the Oberkommando der Wehrmacht (abbrev. OKW) authorized Heeres-Splittermuster 31, more commonly known as "splinter pattern", for use in shelter-quarters (Zeltbahnen) in the 1930s. In 1940, SS-Verfügungstruppe (abbrev. SS-VT; renamed Waffen-SS) designed, tested and issued its own distinctive patterns and layout not long after. The United States Marine Corps received its first military camouflage pattern in 1942, when the reversible, beach-jungle, three- and five-color frog-skin pattern uniform was issued, based on a 1940 trial design. The pattern was mostly employed in the Pacific Theatre, but was not found to be particularly effective and in the European Theatre the pattern was withdrawn altogether in 1944—in part because of anticipated friendly fire incidents after D-Day, due to its similarity to the Waffen SS's pattern (not to be confused with Flecktarn, a post-war design). Camouflaged helmet covers and shelters were issued in the 1950s in "wine leaf" and "brown cloud" patterns. The U.S. Army also tried a lesser-known camouflage uniform on D-Day and throughout the Normandy operations, like the Marine Corps' uniforms, but it was replaced by the M43 uniform before being used much. During the Vietnam War, the United States Armed Forces' four-color ERDL pattern saw limited use among specialist units in the U.S. Army, though most were issued the solid olive green OG107 sateens or jungle fatigues, while the Marines adopted the pattern service-wide after 1968. The general design and configuration of the U.S. BDU uniform was similar to that of Vietnam War's jungle fatigues, which were in turn similar in configuration to specialty uniforms worn by U.S. paratroopers during World War II. Woodland camouflage. (in near infrared). First issued in limited number to garrison leaders, officers and generals to all branches of the U.S. Armed Forces in September 1981 for replacement of the long worn and aging Olive Drab colored uniforms or OG-107, the following month, the Battle Dress Uniform began field issue military wide. BDUs were initially only issued in a 50/50 nylon and cotton twill blend, called the Temperate Weather BDU, or TWBDU. Complaints regarding the heat retention of these uniforms, especially following the invasion of Grenada in 1983, led to the introduction of the Hot Weather BDU, the HWBDU. The Hot Weather BDU coat and trousers were constructed of 100 percent ripstop cotton, in a four-color woodland camouflage pattern. However, after complaints of shorter wear and frayed cuffs, along with requirements imposed by unit commanders to starch the all-cotton uniform for parade, the Enhanced Hot Weather BDU (EHWBDU) replaced the HWBDU commencing in 1996. The EHWBDU's components are made with 50/50 ripstop nylon and cotton poplin blend. BDUs were printed with infrared-brightened dyes. Near infrared (NIR) Signature Management Technology is used in the uniforms to help prevent detection by NIR Image Converters. These photocathode devices do not detect temperatures, but rather infrared radiation variances. NIR-compliant uniforms use a special fabric that allows soldiers to appear at the same radiation level as the surrounding terrain, thus making them more difficult to detect. It is advised not to use starch when cleaning or ironing BDUs, since starch weakens the fabric and ruins the infrared protective coating. A pair of BDUs that has been starched even once should not be worn in combat. The tropical weight uniform was not as durable as the temperate weight uniform. The tropical uniform would only last for 4–6 months of use when rotating four uniforms for duty, while the temperate uniform would last over a year under the same conditions. All United States Army soldiers formally received their first batches of the BDU as its new field and garrison uniform in the temperate weight cut on October 1, 1981. In addition, Patrol caps, boonie hats and the M-65 jacket were issued in the new camouflage pattern in time, including a new light brown T-shirt and black webbed belt with brass buckle. 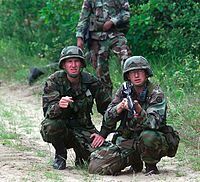 The BDU was the first camouflage uniform approved by the U.S. Army since the Vietnam War, where the ERDL pattern was in limited use. The BDU soon replaced all earlier camouflage pattern uniforms for all wooded, jungle, and tropical environments, and by 1989, had completely replaced the standard olive drab uniforms that had been used since 1952. The BDU was worn by DoD civilians and DoD Police officers. The ERDL-patterned BDU was first introduced to the United States Marine Corps in 1977, as they phased out the Olive Drab Green (OD) uniform. The BDU became the issued uniform for the U.S. Army in September 1981 in the woodland camouflage pattern, to begin replacing the Olive Drab Green (OD) or OG-107 colored fatigues, which had been standard wear since the early 1950s. The change was to better conceal Marines and Soldiers effectively in woodland or tropical Areas of Operation with macro shaped patterns, as opposed to OD, which had only a single shade of green. It was based primarily on the woodland colors specifically of northern Europe. It used shades of green, brown, tan, and black, initially printed onto cotton-nylon blend twill cloth, known as the "Temperate Weight" uniform. A newer lightweight "Tropical Weight" BDU uniform was introduced in 1987 with the pattern printed on 100% cotton rip-stop poplin cloth, to better prevent smaller rips from enlarging. 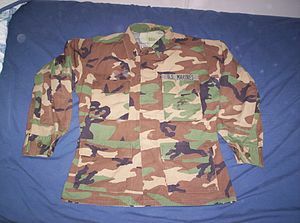 Originally, no nametapes were worn with the USMC's BDUs, which was officially referred to by the USMC as a "camouflage utility uniform" (CCU) during its usage. However, in October 1991, the USMC began the wearing of nametapes on their BDUs (and DCUs and DBDUs) in order to comply with NATO Standardization Agreement (STANAG), becoming mandatory by October 1992. In the USMC's case, a nametape bearing the wearer's last name was worn embroidered above the right pocket, and a nametape reading "U.S. MARINES" being embroidered was worn above the left pocket. The MCCUU which replaced the BDU continues this. The USMC's BDU was worn with a stenciled ironed-on Eagle, Globe, and Anchor (EGA) centered on the wearer's left breast pocket, below the pocket flap. Early USMC BDUs featured "USMC" lettering below that EGA, however, that was discontinued later on, with only the sole EGA being used by the end of the BDU's tenure with the USMC. The EGA was ironed-on to the BDU blouse pocket by USMC recruits at the end of MCRD upon completion of their training to signify their christening as U.S. Marines. The same was done on the eight-point "utility cover" hat that was worn with the USMC's version of the BDU. The BDU's successor, the MCCUU, has the EGA embroidered instead of stenciled on the blouse and all hats. Airmen of the U.S. Air Force initially only issued its ERDL BDUs to over seas stationed combat arms units such as United States Air Force Security Forces, Combat Controllers, and United States Air Force Pararescue PJs October 1, 1981, the same time as the Army and Marines. The Air Force did not allow non combat arms to wear the woodland pattern BDU until the summer of 1987, and mandated them as the only "Fatigue" uniform until 1988. Sailors of the United States Navy started issuing the BDU in the new woodland scheme and temperate cut the same time as the other branches. The U.S. Navy referred to the uniform as the "Camouflage Utility Uniform" (CUU) during its usage. Coast Guardsmen started issuing the new woodland BDU around the same time as the other service branches. U.S. soldiers (from left to right) showcase the Army Combat Uniform (left), Desert Camouflage Uniform (center), and a World War II-era uniform (right), in May 2005. U.S. soldiers in 2006 wearing BDUs while on a training exercise in Louisiana; the BDU was authorized by the U.S. Army until 2008. The U.S. military has run trials of many camouflage patterns (some being used by foreign militaries), and issued environment-specific uniforms, notably the six-color Desert Battle Dress Uniform (DBDU), nicknamed the "chocolate chip camouflage", designed in 1962, and the "nighttime desert grid" (NCDBDU). Both uniforms were used in 1991, during the Persian Gulf War. These Desert BDUs were discontinued after the war. The Desert Camouflage Uniform (DCU) in three-color desert camouflage was introduced in 1992, and was utilized in operations in Somalia (1993); it was in service in Afghanistan and Iraq from the start of hostilities, but the U.S. Army and U.S. Marine Corps have both replaced the DCU with newer uniforms (ACU and MCCUU, respectively). In testing, U.S. Army researchers found that, as in other environments, the color of desert terrain varies, and can range from pink to blue, depending on the minerals in the soil and the time of the day. Since patches of uniform color in the desert are usually 10 times larger than those in wooded areas, it was decided to alter the existing six-color DBDU pattern. This led to the development of a three-color pattern DCU, which was adopted. The development of modern camouflage patterns and the rising desire of the various U.S. military branches to differentiate themselves from each other has resulted in new patterns for uniforms. The U.S. Marine Corps was the first branch to replace their BDUs. The Marine Corps Combat Utility Uniform (MCCUU) uses the computer-generated MARPAT pattern and several other enhancements. It was approved for wear in June 2001, became available for purchase in 2002, and the changeover was completed by October 1, 2004. The BDU was authorized for wear until April 1, 2005 in limited exceptions for those small numbers of Marine Corps personnel who did not yet have the MCCUU. USMC Special Operations units (MARSOC) have recently issued M81 woodland-patterned uniforms to supplement MARPAT uniforms for special missions. 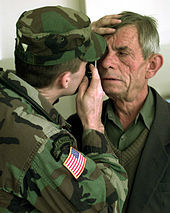 A U.S. Army medical officer wears a BDU when examining a man's eyes in January 2000. In 2004, the U.S. Army unveiled the Army Combat Uniform (ACU), its successor to the BDU. From late 2005 to early 2008, the U.S. Army undertook the process of replacing the BDU with the ACU, with the BDU being formally discontinued by the army in April 2008. The Army Junior ROTC followed suit thereafter in 2009. The original version of the ACU uniform used a pixelated "digital" pattern known as the Universal Camouflage Pattern (UCP). UCP is similar to MARPAT, but uses more neutral, less saturated colors. The neutral colors, primarily foliage green and sand yellow, are designed to be work best in desert, woodland, and urban combat situations. The ACU in UCP was used by the army in all environments except for areas with snow, as the UCP pattern works poorly against white despite the heavy use of grey. An all-white BDU and the ECWCS are used instead for winterized warfare. 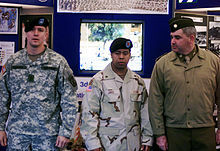 DoD civilians began wearing the Airman Battle Uniform and Army Combat Uniform in place of the BDU after it was replaced. From 2004 to 2007, the U.S. Navy began issuing a pixelated blue and gray "digital" pattern Navy Working Uniform (NWU) in limited quantities on an experimental basis. While the NWU is neither a tactical uniform nor a battle dress uniform, it is intended to take the place of many existing work ensembles (utilities, wash khaki, coveralls, M81 BDU, etc.). The disruptive pattern is primarily intended to complement U.S. Navy ship colors and to hide stains and wear, and supposedly to make the wearer a less obvious visual target for hostile forces while working aboard a naval vessel in port. To meet the Navy's cold-weather requirements, the NWU includes a fleece jacket, pullover sweater, and parka options. U.S. Navy SEALs, Seabees, and other U.S. Navy personnel deployed ashore under the cognizance of U.S. 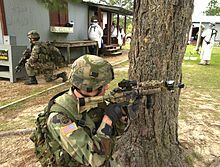 Naval Forces Central Command used "M81" woodland BDUs (referred to by the navy as CCUs) and DCUs for outdoor operations or activities in specific areas of responsibility (AOR), until the issuance of the NWU Type III in the AOR camouflage pattern. In 2008, responding to criticism that the new Airman Battle Uniform was too heavy and hot in high-temperature environments, the USAF's 648th Aeronautical Systems Squadron at Brooks City-Base revealed plans to switch to a lighter, more breathable fabric for the combat blouse section of the ABU. The original heavyweight nylon-cotton blend was changed to a lighter-weight nylon-cotton poplin material. Priority will go to those serving in the Middle East or other hot-weather theaters. On May 4, 2016, the National Commander of the Civil Air Patrol announced the USAF's approval for the Civil Air Patrol to begin its transition to the Airman Battle Uniform. On May 14, 2018, the Air Force announced the adoption of the Army's Operational Camouflage Pattern uniform, however, insignia will be distinctive. Transition is to be complete by April 1, 2021. The U.S. Coast Guard has introduced the new Operational Dress Uniform (ODU) uniform in 2004 to replace the winter and summer "Undress Duty" uniform. Resembling the BDU, the ODU retains the basic design of the old-style BDU uniforms, but with the lower pockets on the blouse being eliminated. The sleeves can be worn "folded up" in a manner similar to the old U.S. Army and U.S. Air Force BDUs (since disallowed with the Army ACU) and the trousers "bloused" into the boots (unless boating shoes are worn, as is common for the U.S. Coast Guard Auxiliary, which patrols for the Coast Guard aboard privately owned watercraft), with the ODU black belt and blackened buckle being worn with the metal tip two to four inches from the buckle. The ODU is also issued in a single blue color as opposed to any camouflage pattern. The dark blue Coast Guard unit baseball-style cap is worn with this uniform. The ODU also has all of its allowable insignia sewn on, eliminating the chance of puncture wounds created by the pins if the individual suffers a blow to the chest while wearing a PFD or body armor. The ODU is not intended to be worn by Coast Guard units which engage in combat operations or are deployed overseas. These units continued to wear older woodland BDU and DCU uniforms before adopting the Navy Work Uniform for USCG units overseas or part of other DoD operations. The BDU in MultiCam camouflage is in use today mainly by the public, public service persons, and some foreign military units. BDUs can be purchased from civilian vendors in the UCP pattern analogous to the ACU as well, but these are not authorized for wear by U.S. Army soldiers. ^ a b "Army to Retire BDUs". ^ "ACU changes make Velcro optional, patrol cap default headgear". ^ "MANDATORY POSSESSION DATES FOR THE MARINE CORPS COMBAT UTILITY ;UNIFORMS (MCCUU) AND MARINE CORPS COMBAT BOOTS (MCCB)". The Official United States Marine Corps Public Website. September 22, 2004. Retrieved November 7, 2017. ON A CASE-BY-CASE BASIS, COMMANDERS MAY LOCALLY EXTEND THE MANDATORY POSSESSION DATE TO 1 APRIL 2005, BUT NO FURTHER EXTENSIONS ARE AUTHORIZED. ^ "DIMOC - Home Page". www.defenseimagery.mil. ^ a b "Propper Authorized Supplier - Propper ACU, BDU, Multicam, Military Uniforms from BDUDirect.com". www.bdudirect.com. ^ "Saturday, February 10, 2001". March 4, 2001. ^ Admin. "DOD Civilian Police Officer - John1911.com Gun Blog". ^ Dolt, Kevin (October 31, 1991). "Marine uniforms to include name tapes" (PDF). Hawaii Marine. 20 (43). p. A-4. Retrieved March 12, 2017. The wearing of nametapes on the utility uniform will become mandatory by Oct. 1, 1992, and to help defray the costs involved in getting them sewed on, Headquarters Marine Corps authorized a one-time payment of $24 to all enlisted active-duty Marines, which was included in the Oct. 15 paycheck. ^ "INSPECTION PREPARATION CPL NCO'S ARE RESPONSIBLE FOR SUPERVISING THE PREPARATION FOR AN INSPECTION. - ppt download". slideplayer.com. ^ "COMBAT UTILITY UNIFORM AND BOOT GUIDANCE". ALMAR 028/02. The Official United States Marine Corps Public Website. May 20, 2002. Retrieved November 7, 2017. ^ "ABCNEWS.com : Marines Get Permanent Press Battle Dress". February 4, 2002. ^ "Answering the call – Army and DoD civilians volunteer to deploy". DVIDS. ^ "DoD civilian finally gets to deploy > U.S. Air Forces Central Command > Display". www.afcent.af.mil. ^ "Strategy Page, Military Photos: The New Navy Work Uniform". 2004. ^ "CAP Transition to the Airman Battle Uniform (ABU)" (PDF). capmembers.com. May 4, 2016. p. 1. Retrieved May 9, 2016. ^ Secretary of the Air Force Public Affairs (May 14, 2018). "Air Force transitions to a single combat uniform". US Air Force. Retrieved May 15, 2018.